...with the brief message from you urging them to "Print and Read Now!" Your top priority right now, though, is preparing for your own immediate family survival! with expected blast destruction followed by widespread radioactive fallout downwind. IF ONLY A 'Dirty Bomb' Attack (Not the vastly more devastating nuclear weapon blasts with fallout discussed below.) - You can expect localized and downwind contamination from the explosion dispersing radioactive materials. If you are near enough to see or hear any local bomb blast, assume that it includes radiological or chemical agents. You should move away from the blast area as quickly as possible. If the wind is blowing toward you from the direction of the blast, travel in a direction that is crosswise or perpendicular to the wind as you move away from the blast area. If possible cover your face with a dust mask or clothing to avoid inhaling potentially radioactive dust. Upon reaching a safe location, discard outer clothing, then shower as soon as possible. Refer to local news sources for additional instructions about sheltering or evacuation. The government is better prepared to direct and assist the public in isolated 'dirty bomb' emergencies, unlike much more serious nuclear weapon attacks below. THEN TAKE EFFECTIVE PROTECTIVE ACTION, BEFORE THEY STRIKE, WITH CONFIDENCE... FAST! If you are considering evacuation, your decision requires very high confidence that it is worth the risk. You do not want to get stuck between your current location and your hoped for destination, as there will probably be no easy moving forward or getting back. If you fail to get to your destination, you may be exposed without shelter, in a dangerous situation, perhaps among panicked hordes of refugees. Whatever supplies you have may be limited then to what you can carry on foot. IF you are in a big city or near a military target, AND you have relatives or friends in the country or sufficient resources, AND the roads between you and them are clear, AND the authorities are not yet restricting traffic, AND you have the means and fuel, evacuation may be a viable option for a limited time. DO NOT attempt evacuation if all of the above is not clearly known, or if the situation is deteriorating too quickly to assure the complete trip. You do not want to get stuck and/or become a refugee being herded along with panicked masses. If evacuation is truly a viable option, do not wait - GO NOW! Do so with as many of the supplies listed in #7 as possible. Better to be two days too early in arriving than two hours too late and getting snagged mid-way, potentially exposing your family to a worse fate than having stayed where you were. Because of the very real danger of getting caught in an evacuation stampede that stalls, almost all families will be better off making the best of it wherever they currently are. Because time is of the essence, you need to first delegate and assign to different adult family members specific tasks so they can all be accomplished at the same time. Your first priorities to assure your family survival are Shelter, Water, and Food/Supplies. While some are working on the water storage and shelter at home, others need to be acquiring, as much as possible, the food and supplies, if stores not already besieged. Because much of the food and supplies listed at #7 of this guide may quickly become unavailable, you need to assign someone NOW to immediately go to the stores with that list! Get cash from the bank and ATM's first, if it can be done quickly, but try and use credit cards at the stores, if at all possible, to preserve your cash. With one or more adults now heading to the stores with the list at #7, those remaining need to begin storing water IMMEDIATELY! Lack of clean water will devastate your family much more quickly and more severely than any lack of food. Without clean water for both drinking and continued good sanitary practices in food preparation and for bathroom excursions (which could become less sanitary than normal), debilitating sickness could rampage through your family with little hope of prompt medical attention. That is a likely but, avoidable, disaster, ONLY IF you have enough water. Every possible container needs to be filled with water RIGHT NOW! It will be very hard to have stored too much water. When the electricity/pumps go down or everybody in your community is doing the same thing, thus dropping the water pressure, what you've got is all you might be getting for a very long time. Empty pop bottles (1-3 liter) are ideal for water storage, also filling up the bathtub and washing machine. (Remember, later you'll have some in your hot water tank.) If you have any kiddie pools or old water beds, pull them out and fill them up, too. (Water from a water bed should be used only for bathing or cleaning, not for drinking as it may contain traces of algaecide and/or fungicides.) Anything and everything that'll hold water needs to be filled up quickly RIGHT NOW!! One of the shopping items listed at #7 is new metal garbage cans and liner bags which you'll also use for storing water. If you can't get any more new cans, you could clean out an existing garbage can, then put in a new garbage bag liner and fill it with water. Even sturdy boxes and dresser drawers could be used with bag liners. Choose well where you fill up garbage cans with water because they won't easily be moved once full and many of them together could be too heavy for some upper floor locations. Ideally, they need to be very near where your shelter will be constructed and can actually add to its shielding properties, as you'll see below. BE ASSURED, YOU CANNOT STORE AND HAVE TOO MUCH WATER! Do not hesitate, fill up every possible container, RIGHT NOW! The principles of radiation protection are simple - with many options and resources families can use to prepare or improvise a very effective shelter. You must throw off any self-defeating myths of nuclear un-survivability that may needlessly paralyze and panic, and then seal the fate of, less informed families. Radioactive fallout is the particulate matter (dust) produced by a nuclear explosion and carried high up into the air by the mushroom cloud. It drifts on the wind and most of it settles back to earth downwind of the explosion. The heaviest, most dangerous, and most noticeable fallout, typically dark grit, will 'fall out' first closer to ground zero. It may begin arriving minutes after an explosion. The smaller and lighter dust-like particles will typically be arriving hours later, as they drift much farther downwind, often for hundreds of miles. Once it begins to arrive, whether visible or not, all that will fall will usually do so in about an hour, coating everything, just like dust does on the ground and roofs. However, rain can concentrate the fallout into localized 'hot spots' of much more intense radiation with no visible indication. This radioactive fallout 'dust' is dangerous because it is emitting penetrating radiation energy (similar to x-ray's). This radiation (not the fallout dust) can go right through walls, roofs, windows and clothing. Even if you manage not to inhale or ingest the dust, and keep it off your skin, hair, and clothes, and even if none gets inside your house, the radiation penetrating your home is still extremely dangerous, and can injure or kill you inside. Radioactive fallout from a nuclear explosion, though very dangerous initially, loses its intensity quickly because it is giving off so much energy. For example, fallout emitting gamma ray radiation at an initial rate over 500 R/hr (fatal with one hour of exposure for 50%) shortly after an explosion, weakens to only 1/10th as strong 7 hours later. Two days later, it's only 1/100th as strong, or as deadly, as it was initially. That is really very good news, because our families can readily survive it IF we get them into a proper shelter to safely wait it out as it becomes less dangerous with every passing hour. What reduces radiation, and thus protects your family, is simply putting distance and mass between them and the radiation source. Like police body armor stopping bullets, mass stops (absorbs) radiation. The thicker and heavier the mass, the more radiation it stops, and the more effective it is with every inch more you add to your fallout shelter. The thickness in inches needed to cut the radiation down to only 1/10th of its initial intensity for different common materials is: Steel 3.3", concrete 11", earth 16", water 24", wood 38". The thickness required to stop 99% of the radiation is: 5" of steel, 16" of solid brick or hollow concrete blocks filled with mortar or sand, 2 feet of packed earth or 3 feet if loose, 3 feet of water. (BTW, lead is nothing special, same as anything else pound for pound.) You may not have enough steel available, but anything you do have will have mass and can be used to add to your shielding - it just takes more thickness of lighter wood or books, for example, than heavier earth, to absorb and stop the same amount of radiation. Increasing the distance between your family inside and the radiation outside also greatly reduces the radiation intensity. While a fallout shelter can be built anywhere, you should see what your best options are at home or nearby. Many structures already provide significant shielding or partial shielding that can be enhanced for adequate protection. If you do not have a basement available, you can still use the techniques shown below in any above ground structure, you'll just need more mass to achieve the same level of shielding. You may consider using other solid structures nearby, especially those with below ground spaces, such as commercial buildings, schools, churches, below ground parking garages, large and long culverts, tunnels, etc.. Some of these may require permissions and/or the acquiring of additional materials to minimize any fallout drifting or blowing into them, if open ended. Buildings with a half-dozen or more floors, where there is not a concern of blast damage, may provide good radiation protection in the center of the middle floors. This is because of both the distance and the shielding the multiple floors provide from the fallout on the ground and roof. Bottom Line: choose a structure nearby with both the greatest mass and distance already in place between the outside, where the fallout would settle, and the shelter occupants inside. If you have a basement in your home, or at a nearby relatives' or friends' house that you can use, your best option is probably to fortify and use it, unless you have ready access to a better structure nearby. For an expedient last-minute basement shelter, push a heavy table that you can get under into the corner that has the soil highest on the outside. The ground level outside ideally needs to be a couple feet above the top of the table shelter inside. If no heavy table is available, you can take internal doors off their hinges and lay them on supports to create your 'table'. Then pile any available mass atop and around the other two open sides such as books, cord wood, bricks, sandbags, heavy appliances, full file cabinets, full water containers, your food stocks, even boxes and pillow cases full of anything heavy, like dirt. Everything you can pile up and around it has mass that will help absorb and stop more radiation from penetrating inside - the heavier the better. However, reinforce your table and supports so you do not overload it and risk collapse. Leave a small crawl-through entrance and more mass there that can be easily pulled in after you, but with a gap at the top to allow exhaust air out. Have another gap of 4-6" square low at the other end for incoming fresh air. Make bigger if crowded and/or hotter climate. A small piece of cardboard can help fan fresh air in if the natural rising warmer air convection current needs an assist moving the air along. This incoming air won't need to be filtered if the basement has been reasonably sealed up, however any windows or other openings will require some solid mass coverage to assure they stay sealed and to provide additional shielding protection for the basement. More details on this in the next (#6) section. With more time, materials, and carpentry or masonry skills, you could even construct a more formal fallout shelter, such as the FEMA lean-to on the right, but you will need to assure structural integrity is achieved and adequate mass is utilized. 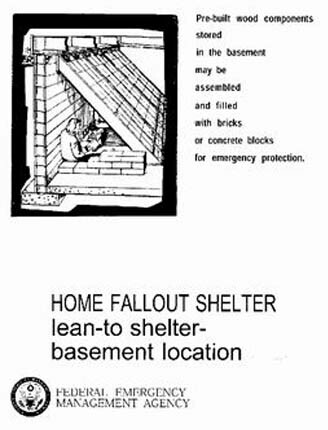 An effective fallout shelter constructed in a basement may reduce your radiation exposure 100-200+ fold. Thus, if the initial radiation intensity outside was 500 R/hr (fatal in one hour for 50%), the basement shelter occupants might only experience 5 R/hr or even less, which is survivable, as the radiation intensity will be decreasing with every passing hour. Adding mass on the floor above your chosen basement corner, and outside against the walls opposite your shelter, will also increase your shielding protection. Every inch thicker adds up to more effective life-saving radiation shielding. 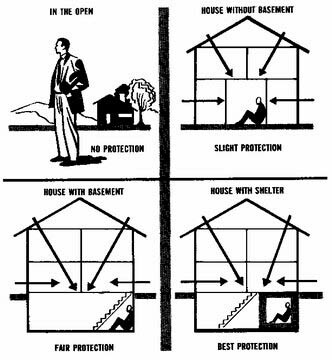 As cramped as that table space fallout shelter might seem, the vital shielding provided by simply moving some mass into place could be the difference between exposure to a lethal dose of radiation and the survival of your family. The majority of people requiring any sheltering at all will be many miles downwind, and they will not need to stay sheltered for weeks on end. In fact, most people will only need to stay sheltered full-time for 2-3 days before coming out to safely join the evacuation, if even still necessary then. As miserable and cramped as it might seem now, you and your family can easily endure a couple days of that, especially compared to the alternative. 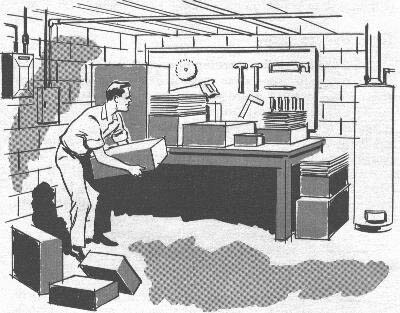 It's really not so difficult to quickly build an effective family fallout shelter, especially if you get started planning it before needed! If close to a target, your first indication of a nuclear detonation may be with its characteristic blinding bright flash. The first effects you may have to deal with before radioactive fallout arrives, depending on your proximity to it, are blast and thermal energy. Promptly employing the old "Duck & Cover" strategy, immediately upon the first indication of the flash, will save many from avoidable flying debris injuries and minimize thermal burns. Those close could soon experience a brief, tornado strength, wind blast and should quickly dive behind or under any solid object, away from or below windows. Even in the open, just laying flat, reduces by eight fold the odds of being hit by any debris. A very large 500 kiloton blast, 2.2 miles away, will arrive about 8 seconds after the detonation flash with a very strong three second wind blast. That delay is even greater farther away. That is a lot of time to duck & cover IF alert and you should stay down for 2 minutes. If not near any target 'ground zero' you will only, like the vast majority, have to deal with the fallout later. Government information and guidance is a vital resource in your response to a nuclear crisis, but for many reasons it may be late, incomplete, misleading or simply in error. While evacuation might be prudent for individuals who act quickly in response to a threat, governments will be slow to call for mass evacuations before an event because of their potential for panic and gridlock. As past government calls for duct tape and plastic led to sold-out stores, anxiety, and derision from the press, there will be great reluctance to issue similar alarms. If you want to assure that you have adequate food, water & shelter for your family you must act BEFORE the panic without first waiting for government instructions that may never come or as urgently as warranted. You alone are ultimately responsible for your family. Filtering the air in your basement shelter won't be required. Air does not become radioactive, and if your basement is reasonably snug, there won't be any wind blowing through it to carry radioactive fallout dust inside. Simply sealing any basement windows and other openings prevents significant fallout from getting inside. To improve both the radiation shielding inside the basement, and to protect the windows from being broken and letting fallout blow in later, you should cover them all with wood, and then with earth, sandbags or solid masonry blocks, etc. on the outside and even the inside too, if possible. If the basement air gets stale later on, you could re-open a door into the upper floors of the closed house, or secure a common furnace air filter over an outside air opening leading into your basement. Regarding fallout contamination, any food or water stored in sealed containers, that can later have any fallout dust brushed or rinsed off the outside of the container, will then be safe to use. As long as the fallout dust does not get inside the container, then whatever radiation penetrated the food/water container from the outside does not harm the contents. If you suspect that your clothes have fallout on them, remove your outer clothing before you come inside and leave them outside. A cheap plastic hooded rain poncho that can be easily rinsed off or left outside is very effective. Have water and baby shampoo near the entrance to wash and thoroughly rinse any exposed skin and hair. Exposure to fallout radiation does not make you radioactive, but you need to assure that you don't bring any inside. If any are stricken with radiation sickness, typically nausea, it is when mild, 100% recoverable and cannot be passed on to others. Before fallout arrives, you might also try to cover up items you want to protect outside for easier rinsing off of the fallout dust later when it's safe to come out and do so. For instance, if you have a vegetable gardening spot or cordwood for heating, you might try covering some of it with plastic or tarp. If without sufficient time to acquire radiological instruments of your own, like survey meters, Geiger counters and dosimeters, you'll need to be extra sure that your portable radios function properly from inside your shelter and that you have plenty of fresh batteries stocked for them. Without radiological instruments, listening for official guidance about the radiation threat levels in your particular area will be the only way you'll know when it's becoming safe to venture out. It might also be the only way you'll know when you first need to take your initial maximum protective action. When not in use, they should not be attached to any outside antenna or even have their own antenna extended. And, they should be wrapped in any non-conducting insulation, like layers of paper or bubble wrap plastic and then stored in a metal container or wrapped in aluminum foil to minimize the potential of EMP ruining the electronics. Having back-up radios would be very prudent. With extra radios, you can have one always tuned to the closest likely target city and, if it suddenly goes off the air, that could be your first indication of an attack. Same thing if electricity suddenly went out, too. When fallout is first anticipated, but has not yet arrived, anyone not already sheltered should begin using their N95 particulate respirator masks and hooded rain ponchos. Everyone should begin taking Potassium Iodide (KI) or Potassium Iodate (KIO3) tablets for thyroid protection against cancer causing radioactive iodine, a major product of nuclear weapons explosions. If no tablets available, you can topically (on the skin) apply an iodine solution, like tincture of iodine or Betadine, for a similar protective effect. (WARNING: Iodine solutions are NEVER to be ingested or swallowed.) For adults, paint 8 ml of a 2 percent tincture of Iodine on the abdomen or forearm each day, ideally at least 2 hours prior to possible exposure. For children 3 to 18, but under 150 pounds, only half that amount painted on daily, or 4 ml. For children under 3 but older than a month, half again, or 2 ml. For newborns to 1 month old, half it again, or just 1 ml. (One measuring teaspoon is about 5 ml, if you don't have a medicine dropper graduated in ml.) If your iodine is stronger than 2%, reduce the dosage accordingly. Absorption through the skin is not as reliable a dosing method as using the tablets, but tests show that it will still be very effective for most. Do not use if allergic to iodine. Ideally, inquire of your doctor NOW if there is any reason why anybody in your household should not use KI or KIO3 tablets, or iodine solutions on their skin, in a future nuclear emergency, just to be sure there are no contraindications with other medications or existing medical conditions. When you know that the time to take protective action is approaching, turn off all the utilities into the house, check that everything is sealed up and locked down, and head for the shelter. You should also have near your shelter fire extinguishers and additional tools, building supplies, sheet plastic, staple guns, etc. for sealing any holes from damage. Your basement should already be very well sealed against fallout drifting inside. Now, you'll need to seal around the last door you use to enter with duct tape all around the edges, especially if it's a direct to the outside door. You don't need to risk fire, burns, and asphyxiation trying to cook anything in the cramped shelter space, if you have pre-positioned in your shelter enough canned goods, can opener, and other non-perishable foods, that are ready-to-eat without preparation. More food, along with water, can be located right outside your crawl space entrance that you can pull in quickly as needed. For lighting needs within the shelter have some small LED flashlights or LED head-lamps to stretch your battery life. Try not to have to use candles if at all possible. Bring in some books for yourself and games for the children. Throw in a small/thin mattress, some cushions, blankets, pillows, etc. Toilet use will be via a portable camp toilet or 5 gallon bucket with a pool noodle that's been slit lengthwise to fit on it as a seat. Bag liners, preferably sized for it, should always be used and a full-size and bag lined garbage can should be positioned very close outside the shelter entrance for depositing these in quickly to minimize exposure. Hanging a sheet or blanket will help provide a little privacy as shelter occupants 'take their turn'. The toilet needs to have its new 'deposits' sealed up tight with the plastic liner after each use (kitty litter or sawdust added good, too.) and hand sanitizer towelettes nearby. Use a very secure top on the bucket and position it near the wall entrance with the outgoing upper air vent. Pets, and what to do about them, is a tough call if you fail to make provisions for them. Releasing pets to run free is not humane, both for their potential to die a miserable death from radiation exposure outside and/or to be a danger to others, especially with dogs running in the inevitable packs of multitudes of others abandoned. Preparing for them is ideal, if truly realistic and not a drain on limited resources, while 'putting them down' might eventually become a painful, but necessary reality if the disruption of food supplies becomes very long term. 'When An ill Wind Blows From Afar!' document below has more on protecting livestock, farms and gardens. Boiling or bleach water treatments will be used for cleaning questionable water later for drinking. (This is for killing bacteria, not for radiation contamination, which is never a concern for any stored and covered water containers, same for sealed food.) Tap water recently put into clean containers won't likely need to be purified before using. To purify questionable water later, bring it to a roiling boil for 10 minutes at least. If you don't have the fuel to boil it, you can kill the bacteria by mixing in a good quality household bleach at the rate of 10 drops per gallon, and letting it sit for at least 1/2 an hour. The bleach should be at least 5.25% pure, like Clorox, but be sure it has no additives such as soap or fragrance. You can later get rid of the flat taste from boiling, or some of the chlorine taste when using bleach, by pouring it from one container to another several times. There's much more that can be learned to better understand what you are up against and to acquire to help your family survive and to better endure all of this. While time allows, and if the Internet is still up & running, task someone with getting and printing out this additional information and watch the Civil Defense films. Civil Defense films made during the Cold War. Old fashioned, but physics and tactics of radiation protection are timeless. When the TV or radio program switches abruptly to an terse announcement saying: "We Interrupt This Program For This Special Bulletin! ", and your kids look up to you with questioning wide-eyes and eager for assurances, know then that you are confidently ready for them with your own Action Plan ready to go! That's what this is all about... saving our families! This guide was purposely designed with the sober realization that the overwhelming majority of our fellow Americans would not be compelled to read such a guide until a nuclear crisis was imminent and, unfortunately, their preparation options and time to do so then would be very limited. www.ki4u.com and other prepper suppliers will again be quickly sold-out, as all were after 9/11 and Fukushima. This guide will be the best/only help that we can offer then. If you are fortunate enough to be exploring your family preparation needs and options before such a future national crisis, there is much more that you can and should do now to insure that they are even better prepared. If stores are still at all stocked, and safe to go to, try to buy as many of the following items as possible... IMMEDIATELY! There are no quantities listed here on the food items below as family size varies and because, as the emergency and panic widens, many items will become quickly sold-out or quantities restricted and you'll need to try to get more of what does remain on the shelves. At a minimum you should be looking at two weeks of provisions, but much better to be aiming for two months or more. The reality is, if/when we are attacked, it could be a very long time before anything is ever 'normal' again, especially at any grocery stores. Hurricane victims can attest to the prolonged misery and disruptions from such a localized disaster, even with the rest of the country still able to help out. Nobody can begin to imagine how bad the suffering could be, and for how long, if nuclear weapons have gone off... and in multiple locations! The half-dozen top listed and UNDERLINED items below you'll also use some while in the shelter that 2-3 days. They are mostly ready-to-eat that requires no cooking or preparation, just a can opener at the most. (The iodine solution is included here because of its importance for its thyroid-blocking topical use detailed above, IF you do not have KI pills, but it's NEVER to be ingested or swallowed.) The other foods listed below there are better cost/nutrition staples for later use during the extended recovery period. Then follows general non-food supplies, tools and equipment. Plenty of potent Multi-Vitamins, Vit C, Pepto Bismol, aspirin, tylenol, other OTC meds, etc. Iodine solution, like Betadine (16 ounces)- NOT TO BE INGESTED OR SWALLOWED! Toilet paper and, if needed, sanitary napkins, diapers, etc. cook stove and fuel, ammo, etc., if any sporting goods stocks still available. As mentioned above, this guide was written assuming it would not be read by the majority of its intended audience until a nuclear crisis is already fully upon us--when remaining time and resources to prepare will be extremely limited, maybe with only hours remaining before 'the music stops'. For that reason, the food, equipment and supplies listed above in #7 has been restricted to only the most typically available from local resources. If you are fortunate enough to be reading this well before a nuclear threat (or other major disaster) occurs or appears imminent, there's a great deal more that you can and should do beyond the scope of this brief guide. Surviving the initial threats of a nuclear 'event' and radioactive fallout is relatively easy with the proper knowledge and even the most modest of preparations, as we've detailed above. The ongoing bigger challenge, though, will be the one brought on by the extensive and much longer-lasting disruptions of services after you survive the nuclear event and emerge safely once the fallout threat has diminished. You might go many months with little or no new food supplies, along with disruptions of water, sewer, gas, electric, and telephone services, little or no gasoline, and severely limited medical and banking services, law enforcement and fire protection. With more time to research, make plans, and order supplies, families are well advised to acquire more in-depth training, reference books, longer-term food and water stocks, fuel, medical supplies, personal security, communication equipment, radiation monitoring instruments, camping equipment, supplies and tools. Many informative web sites and suppliers make available all of the above, including military MRE's ready-to-eat meals, dehydrated and freeze-dried foods, as well as buckets of beans, rice, and grains. They also offer solar cookers, water purifiers and barrels, compost toilets, comprehensive medical kits and antibiotics, shortwave and local two-way radios, perimeter alarms, alternative energy and heating systems, fuel preservatives, long-term packaged seeds, etc. Survivalblog.com has many of the best outfits advertising there. For radiation meters, dosimeters, KI tablets, nuke prep guides, etc., see www.ki4u.com. If all of this preparation seems daunting, here's one strategy to make it a little less overwhelming: Think in two's. First, acquire all the equipment and supplies your family would need to survive for two weeks if totally cut off from stores and utility and municipal services. It might help to consider all you would need during an extended camping trip in any season. Then, once you've accomplished that, expand your preparations and supplies to meet the goal of surviving at home for two months with no utilities or services. After that, continue adding provisions for two more additional months, with the eventual goal of gathering enough supplies so that your family can survive under these distressed conditions for a year or more. A year might seem like overkill, but you'll no doubt discover that in any disruptive event, numerous friends, neighbors, and relatives will be in need and you will want to help them if you can. Of course, ideally, they should also be preparing their own families for surviving coming disasters, so sharing this information with them might help get them started. Also, for your own family's security, you always want to try to surround yourself with a buffer of like-minded people who are also doing the right things to prepare so they will become helpful allies instead of only a drain on your limited resources. Reality is, they could possibly even become an outright threat for your family retaining enough supplies for the full duration if difficult circumstances were to drag on and became ever more desperate. Some are e-mailing the link to this guide, or printing up extra copies of the pdf version of this guide and mailing it out, with a quick note; "Hope you never need this information, but just-in-case, keep it handy." Few recipients find that low-key approach offensive or alarmist, and many have reported back to us that they were very grateful. Others have printed up extra copies for church members, school or work and still others with the intent to anonymously distribute them to all their neighbors surrounding them if/when a nuclear crisis looms. Point is, you want everybody you care about, and those near and around you, to be preparing, it's both better for them and your families security. Also, everyone that does prepare will be one less family then later standing in line for hours (or days) ahead of others who failed to prep, awaiting a hoped for arrival of a FEMA handout of food or water. Being prepared makes a ton of sense and will one day soon be seen by all, many painfully, perhaps even fatally, as clearly obvious and self-evident. If you're trying to convince yourself or a spouse to make the investment in prep equipment and supplies, also keep in mind this fact: Many of the supplies save money because buying in bulk and stocking up now is less expensive than buying smaller quantities later, especially as inflation ramps up and/or shortages appear. Further, if nothing bad ever happens, you can eventually eat the food and use most of the supplies, like toilet paper, fuel, etc., so they won't go to waste. Job loss -- Having two to four months of food at home would certainly relieve much of the stress of losing your job and being without an income while looking for another. Pandemic -- We could someday see a deadly virus unleashed, like Ebola, that would require families to self-quarantine themselves at home for many weeks to avoid catching the disease. Having these supplies and having made these preparations would make that extremely difficult time more endurable. Natural disasters, economic dislocations, civil disruptions -- Your family could ride out any number, or cascading combination, of these events in much better shape if you are sufficiently prepared. Being prepared and stocking up makes sense on numerous levels, especially during this age when costs for many essentials, such as food, fuel, and ammunition, will surely only continue to increase. Stocking up now both saves money today and may well save your family itself tomorrow. When tough times come, you'll likely discover that people today, overall, are not as resilient as they were in times past. For many of us, our grandparents generation included a higher percentage of self-reliant rural folks who both 'made do' on less while growing and raising their own food. Today, most people are far removed from the land and the routine of being responsible for producing their own food; many even have a dangerous government-dependent mentality of entitlement. Fact is, the morality that both sustained and restrained previous generations during tough times is not as widely embraced in this present population. As a result, many people will more quickly rationalize theft, robbery, looting, and rioting when they fear hunger and deprivation. Crime is already a problem today--even with nobody being hungry, and with law enforcement in place. Crime, then, could explode when hunger threatens and law enforcement is overwhelmed. It is therefore prudent for anyone making serious preparations to also include plans for maintaining their own security if law enforcement is either unavailable or cannot keep pace with the demands of exploding lawlessness. If you do not own or use guns, I would strongly urge you to re-evaluate your personal security. If you find it lacking, acquire some guns and ammunition immediately, after getting some safety and practical tactical training in their use. Ask at your local gun store for advice on defensive arms and to point you to local resources for that essential training. For those who already have weapons, be sure they are effective models and calibers for self-defense, and that you have stocked plenty of ammunition and high-capacity magazines, if needed. Weapons and ammo will quickly disappear, or they will become prohibitively expensive or restricted, once their essential need is suddenly more widely recognized. Once you are well on your way to acquiring your family's preparation tools, equipment, and supplies, consider acquiring extra items to help others and/or to use as future barter goods. You might be able to trade extra water filters, garden seeds, survival books, fuel preservatives, flashlights, batteries, antibiotics, or ammo for other needed products or services. Some people are even converting a modest percentage of their traditional paper investments into some gold or silver coins for trading purposes, as well as for prudent wealth diversification. Having wealth in forms other than solely paper dollars, plastic credit cards, or a 401k account might make the critical difference in one day being able to buy scarce gas or get your gravely ill child to the front of a mile-long line to see the only overworked doctor or dentist or pharmacist in town. It'll sure beat only waving around your last mutual fund or bank statement then. To better avoid unhealthy and overwhelming angst worrying about which future crisis is more/less likely or first, keep in mind that most of your preps will serve you well regardless of what specifically causes any future disruptions. Once you've started making these preparations, strive to stay balanced. Thank God that you have begun, try to awaken others, and begin to confidently relax in your new alert status. You'll then be able to even more fully enjoy life with your family knowing that you're firmly on the road to better being able to handle just about any event that might occur in this quickly changing world. Getting prepared is all about banishing fear, it's insurance against an uncertain future so that you're sleeping sounder at night knowing your families basic essential needs are better covered. Shane Connor is the CEO of www.ki4u.com. Consultants and developers of Civil Defense solutions to Government, NPO's and Individual Families. "KI4U's practical family nuclear disaster guides and essential resources address a critical void in our nations nuclear preparedness. For over a dozen years they've been the model of what I'd have liked to have seen DHS and FEMA doing all along in a very big way nationwide." - Head, Health Physics Unit at Naval Research Laboratory, Washington, D.C.